Incorporating religious practice in marital interventions: To pray or not to pray? Although couples seeking guidance frequently seek out a religious or spiritual counselor, empirically-based marital interventions seldom acknowledge religious and spiritual beliefs. Beach et al. have proposed that, at least for some couples, religious practice is an appropriate element of marital therapy and a potential agent for strengthening and improving marriages. In this commentary, we welcome the development of marital interventions that are sensitive to the beliefs and values of specific populations. At the same time, the suggestion that therapists intervene directly and participate in religious practices with their clients raises serious questions. Given religious doctrines that may not promote healthy relationships, how are therapists to decide which religious teachings to include and which to ignore? How much should therapists adopt the role of religious ministers? For which couples is prayer an appropriate means of marital intervention? How can a behavior as entrenched as prayer be altered? Addressing these questions is crucial for advancing marital interventions that recognize the centrality of religious practice in the lives of many couples. Copyright © 2008 Guilford Press. Reprinted with permission of The Guilford Press. Sullivan, Kieran T., and Benjamin R. Karney. 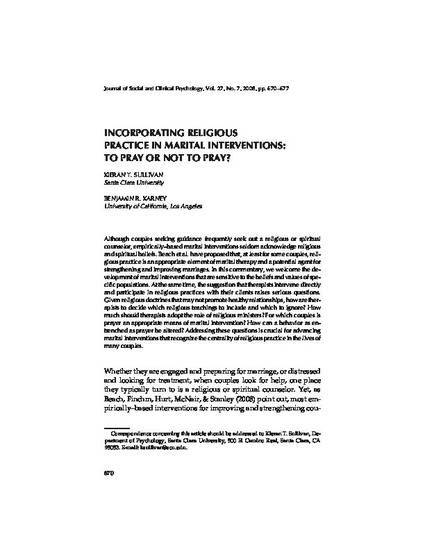 "Incorporating Religious Practice in Marital Interventions: To Pray or Not to Pray?" Journal of Social and Clinical Psychology 27.7 (2008): 670-77.